Location : Lies on the road from Old Goa to Ponda. Main Attraction : Old ruins of the brilliant church. How to Reach : Local transport within Goa is available round the clock. The Church of St. Paul was started as an institution of the Holy Faith for training young converts by two priests namely Diogo de Borba and Miguel Vaz who had established the Santa Fe confraternity. The construction of the church began in November 1541 and got concluded on January 25th 1543, the day of Feast of Conversion of St. Paul to whom the church was dedicated. The College of St Paul was considered among the leading in India. Besides imparting elementary education, higher education in Music, Latin, Arts and sciences was also instructed. Even the degree of Master of Arts and the Doctorate were presented here. After some years, the old college building was pulled down and two separate buildings were constructed, both linked to each other by a passageway. The College had a vast library with numerous books, a hospital and a house for the newly converts and the first printing press in Asia was set up in this College. It was from here the first printed publications came through. In the year 1560, the Church was demolished on account of its fragile state and the foundation stone for a larger Church was laid on 25th January 1560. The building of a new structure in this place met with a rigid opposition of Augustinians and Nuns from Santa Monica. Some other enemies of the Jesuits set fire to the building four times between 1591 and 1675. 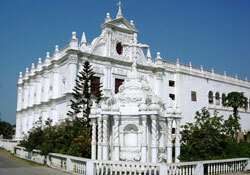 There were some mortal remains of revered St. Francis Xavier deposited in a silver box in this College, which was later taken to Basilica of Bom Jesus. The College and the Church were already in a devastated state by the year 1827. The Government finally demolished it fully in 1829. The material was taken to Panaji to be used for new constructions. The remaining archway of the portico of the Church lies on the road from Old Goa to Ponda just a short distance from the Gandhi Circle, on the left side of the road amid a bunch of trees.